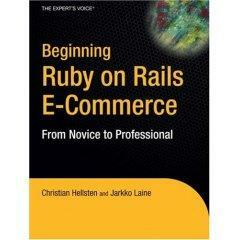 Beginning Ruby on Rails E-Commerce: From Novice to Professional is the first book of its kind to guide you through producing e-commerce applications with Rails—the stacked web framework taking the world by storm. The book dives right into the process of creating a production-level web application using agile methodologies and test-driven development combined with Rails best practices. You’ll take advantage of the latest crop of Rails plug-ins and helpers that will radically improve your programming schedule. You’ll also create a real application step-by-step, plus the book is driven by real-world cases throughout. You can also get it straight from Amazon. Congratulations to both authors on completing the book.